It had been two and a half years since I last ran an Autocross. That experience was shared here and it wasn't good. I was away from home for over 12 hours, almost died in the heat of September and only got in 4 not-so-good runs. 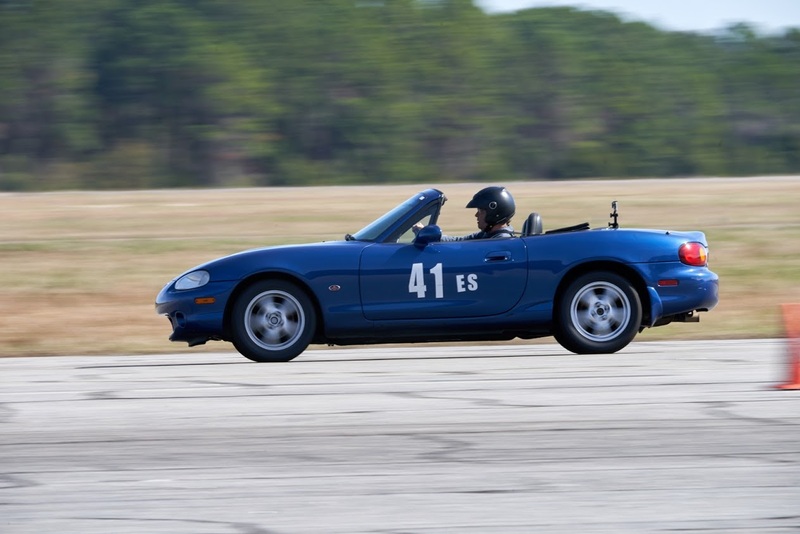 It was enough that I called it my last autocross. But one reason I laid off was that the trusty Miata wasn't running well and the tires were in need of replacement with the latest rubber. So, in the meantime I took the car to Pablo Zapata to have it repaired. It now runs so much better and doesn't leak oil. One of the repairs was new bushings in the shifter, making it much easier to find third gear in the heat of a run. I headed out into the cold of a January morning at 7:00. Stopped for some lunch food and drinks along the way, arriving at the Fernandina Beach Airport at 8:00. The course was set up and I headed that way to check it out when I saw Adam, a fine young driver who has become a good friend over the years. He was doing the tech inspections so I pointed him to my car and he checked it out. It passed. The drivers meeting was a little long but informative. The guys running the show these days gave me my favorite work assignment, starter, so I enjoyed the work time as I could talk to the drivers for a few seconds before sending them off. My run group came up next and I had a clean, relatively fast run on the first try. I checked the results and found that I had the fastest raw time of that group so far. On the second run I was a second faster at 38.6 seconds. I was pleased. Then we ran 5 more and none were as fast as the second. The faster drivers caught and passed me as I was stuck. The new Bridgestone RE71 tires were fantastic. The shifter fix made the two shifts from second to third each run a piece of cake. 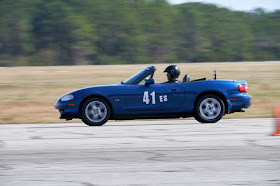 The Miata ran great! It was fun. I ended up third of seven in my class, E Street. 24th out of 52 in raw time and 15th in the handicapped PAX results. A little disappointing after the good start but I was pleased to not embarrass myself. I think I might try again next month. Fast Phil greeted me when I arrived. He is a good friend and a fast driver. Kyle Younger was there with his LS-1 Kart. This is a stripped Corvette. At speed on an early run.